The lovely two-bedroom Casa Roja (Red House) on the 150 acre Finca Estrella is one of only four modern holiday homes in this area of outstanding natural beauty. 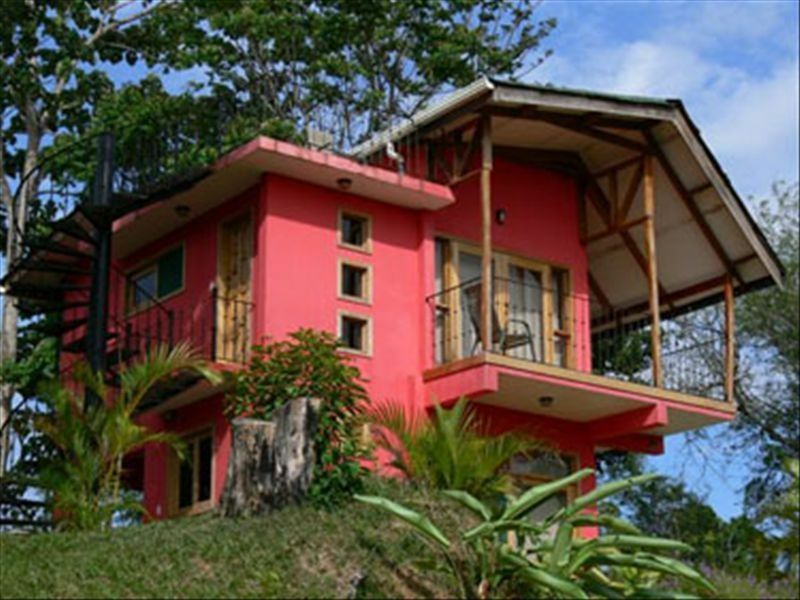 Our neighbors are all wonderful local Ticos (Costa Ricans) so if you want to absorb the real Costa Rican culture, this is the place to stay. Plus we are only minutes from the beach and the local surf break! Read 'A Friend Laughs' by Jo Freeman for the funny and true story of our beginnings. Essential reading for anyone who has dreamt of changing their life. Available from Amazon. Casa Roja is best suited for a couple, a family with older children or two couples. This is because the second bedroom (blue bedroom which has a sink) is accessed from outside, down the spiral staircase, so the house isn't suitable for younger children. The laundry is also downstairs and has a toilet and sink. On the balcony and roof terrace you are surrounded by verdant rainforest teeming with endangered squirrel monkeys, sloths, toucans, scarlet macaws, many different hummingbirds, armadillos, white-faced monkeys, and thousands of iridescent butterflies. The stars from the roof terrace at night are amazing and make sure you keep a look out whilst you are showering in the outdoor shower, a sloth is often spotted in a neighboring tree. Inside the house are orthopedic mattresses, granite countertops in the kitchen, and stunning locally-carved wooden doors with rainforest designs. In the garden there is a huge mango tree and a variety of citrus trees. There are numerous walks for all abilites starting from the finca. You can also mountain bike and horse ride here. The house includes use of the gorgeous 18m swimming pool with children’s pool and barbeque area, waterfall, separate washroom and amazing outdoor shower and our horse is at your disposal - others can be rented for $20 a day from our neighbours. The trek to the beautiful black sand beach at Pilon is a 'must do'. Watch the local surfers on the almost unknown left break, stand-up paddleboard or gawp at the kite-surfers on a breezy afternoon or you may be lucky enough to see the local fishermen in the water with their lines catching your dinner. Fish and jumbo shrimp are often available from them to buy and make a fantastic meal, look for the signs on the beach road or ask them. Talking of food, there are two sodas (small restaurants) at nearby Pilon selling cheap Tico-style food and a bar which serves food and another new soda 10 minutes away in Conte. Pavones, with its world famous left-hand surf break 8km (20-25 minutes)away, has some nice restaurants which include an Israeli vegetarian (great power bars and broccoli quiche! ), Italian and the Mediterranean La Manta that shows surf videos and new and old movies. There are a couple of pulperias (small stores selling basic items) minutes away, a supermarket 10 minutes away and a man in a truck drives to your door every Monday with fresh fruit and vegetables. Pineapples, mangoes, watermelons, papayas, cashews, a wonderful type of lychee, coconuts, guavas, ice cream beans, oranges, lemons, and grapefruit can all be picked at the finca depending on the time of year. Come and see what you can find! A 4x4 rental car is advisable and absolutely necessary in the height of the rainy season. Solid Car Rental are based near the airport in Golfito or 4x4rentacar are a good cheap option in San Jose if you want to drive down. Other companies will deliver a car to Golfito Airport for you. Pay-as-you-go is available at the house. Unlimited w-fi is available at the pool (a two minute walk). There is a balcony on two sides of the house giving fantastic rainforest views. 18m pool with children's pool shared with the three other houses on our 150 acre finca. Horses are available for rent from our neighbours for a small fee for bird/butterfly/wildlife watching around the finca or treks to the local beach or waterfall. Grace, our cleaner and great friend, can paint the most amazing flowers or butterflies (or snowmen!) on your nails if you would like to return home with a bit of paradise.... The barbeque/grill in the rancho at the pool is great for entertaining or pool parties. A sweet oasis on a working farm in the heart of the real Costa Rica! This was my second stay at Casa Roja and I wasn’t disappointed! I love this sweet little house. A washer and dryer is a godsend because all of the recreational activities in Costa Rica include getting a little messy. The pool is a fabulous perk and we we swam twice a day at the very least. The view from the pool is absolutely phenomenal as well! You are likely to see monkeys cruising by at some point while you lay in the hammock on the terrace. Sunsets on the lake I fix side of Costa Rica are gorgeous and I highly recommend watching from the roof with a glass of rum and your camera. I hope to go back as soon as possible and would recommend spending a little time at the Finca Estrella to anyone and everyone! Pura Vida! We found Casa Roja at Finca Estrella the perfect tropical retreat, set in the jungle with lovely views of the Gulf and Pacific and Zancudo Beach. The house was well-appointed and comfortable and had all we needed for our relaxing stay. Being off the beaten track and surrounded by jungle, Casa Roja's balcony and rooftop terrace let us watch amazing birds – toucan, scarlet macaw, parrots, woodpeckers and many more – over our morning coffee. The surrounding trails offer incredible opportunities to see monkeys, a huge variety of birds, interesting, unusual insects, and beautiful tropical plants. The lovely tiled pool, with its terrific view of the valley toward the Gulf, provided a welcome afternoon respite from the heat. We picked bananas every day from the bunch Freddy our helpful Tico neighbour hung nearby. The local guide who organized our horse-back riding and waterfall hikes was welcoming and knowledgeable and with much better English than our Spanish. Maybe the best part was getting to know our neighbours, including the vibrant extended Tico family who all lived nearby. We loved our time there and are already looking forward to going back next year. Theresa and Barry, Ottawa, February 2017. Dear Theresa and Barry, thanks for the lovely review. It was great to meet you guys and very pleased you'll be back next year. Barry, I hope you're finding lots of interesting insects back at home! Saw our first sloth here. Definitely made our stay .. You can swim in the pool and look over the Pacific beautiful . The only downside is the road up to casa roja . Definitely a 4 wheel drive needed and even then a bit rough . Glad you enjoyed your stay guys! We've been promised repairs to the road very soon! When we planned our trip to CR my first question to my girlfriend was "where do most of the tourists go"? She showed me on a map and I pointed to the other end of the country and said that is where I wanted to go. We searched and finally settled on Casa Roja and we weren't disappointed. The beauty of the area was breathtaking. Sitting on the balcony in the morning and watching the jungle wake up was so very relaxing. Since I work with wildlife the number of birds, butterflies and mammals in the area was nothing less than spectacular. We explored the entire property and found fresh mandarin limes and banana's which were relished everyday.Our excursions along the beach from Zancudo down to Punta Banco were awesome and the food in the area was delicious. I would be remiss if I didn't mention what an awesome host Freddy is. He was incredibly kind,helpful and a pretty funny guy. He is the epitome of what life is all about in the Pavones area. We even had the company of some of the sweetest dogs. Many thanks for the nice, review Mike. We're really pleased you had such a great time. I'll pass on your kind words to Freddy - we're very lucky to have him. This was our third trip to Casa Amarilla and I always leave hoping there will be many more to come. This time we only stayed for a week. In the past we'd stayed for a month. I wish we could stay for a year! We absolutely love it here. Pavones is an amazing area that is still sort of a best kept secret. On the drive from SJO to Finca Estrella you pass through the bustling touristy towns of Jaco, Hermosa, and Manuel Antonio where you sometimes see more American's than Ticos. As you drive further south everything becomes a little calmer. The beaches are beautiful. We love Pilon because we are almost always the only people there and it is a short drive down the hill. My husband even made the journey by foot two years ago. I definitely recommend a 4WD vehicle for getting around. Each year that we've stayed we've seen monkeys, toucans, and macaws all from the deck. Nature is all around you here. You see from your bedroom windows what others pay for tour guides to see. And if you don't notice it on your own Freddy is always there to help point things out. I could go on and on about the incredible kindness of the people who work on Finca Estrella for pages and pages. Freddy is the most easy going and helpful person. My children talk about Grace all the time. We were happy to go on an excursion to a waterfall with her husband Enrique who is a phenomenal tour guide. The minute we get home from this place I start looking for flights back. The bay of Pavones is one of the few truly unspoiled corners of paradise left in Costa Rica where endangered monkeys lunch in fruit trees at the side of the road, scarlet macaws squawk overhead and giant dazzling blue butterflies flap by. The beaches are wild and stunning and the warm waters are fantastic for surfing and boogie boarding. Or, if you fancy something different, follow dolphins watching silvery fish jumping in the waves while you stand-up paddleboard in the perfect water at Pilon. If you prefer to stay on the sand then there are a myriad of beautiful seeds to find, kitesurfers to admire, seabirds by the dozen. Pick up fish for the grill on the way home from the fishermen, most likely your only companions on the endless stretch of perfect sand. Local fishermen will happily oblige if you want to join them in their boats to catch some mackerel, sea bass, snook (robalo), dorado (mahi-mahi) or red snapper. For the more adventurous, sportfishing can be arranged with Zancudo Lodge or the marinas of Golfito. Boat trips can also be arranged for visits to the Osa Peninsula, the Orchid Gardens, Wild Animal Refuge, Zipline Canopy Tours or Kayaking in the Rio Coto (River) - whales, dolphins and turtles are often spotted from the boats. You can ever waterski! Trek with Freddy and Enrique around the extensive finca or to the local waterfalls, walk or take the horses, and lunch in the cool shade on mossy logs before taking a plunge or even clamber up the rocks to stand under the refreshing torrent. The 'pozo' - swimming hole - at the Cuervito River is a must on a hot day. Jump off rocks or fallen logs and relax in perfect surroundings listening to your jungle 'music'. On 'rest' days, the hammocks by the beautiful 18m swimming pool will be waiting for you. Swing serenely listening to the toucans, the buzzing of hummingbirds' wings, the parrots' chatter and Freddy or Enrique will gently nudge you when the monkeys/sloths/anything else you would like to see is around. The water spouts from passing whales have been spotted from the finca - the gulf teems with sealife so always keep a lookout when you are driving along the beach road towards Pavones. There are local 'sodas' for eating out and 'pulperias' for groceries. The laid back nearby surfer town of Pavones has a surf shop, restaurants and a supermarket plus the most amazing beachfront yoga studio!